Meet Fancy (THEKIDLIKESSCOTCH)- she is a 15.1 hand, 8 year old AQHA registered mare. Bay with star, snip and right rear sock. She was born and raised until she was 7 years old in Michigan. She was foaled and left an orphan at 3 months of age (her dam passed away) then her previous owner before me, Dixie, raised her and trained her. 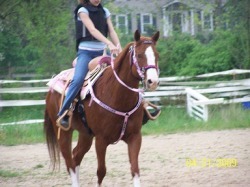 The reason for selling was Dixie wanted a reining horse, which Fancy proved not to be. She was sold at an auction where she was bought and shipped to Pennsylvania. Barry Hartranft in Ephrata, Pa sold her to me. 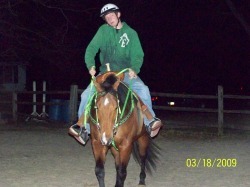 She has been a great little mare for us! See her bloodlines below! 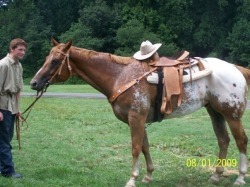 Meet Rocky (SKIP LENS REWARD)- he is a 16.2 hand, 5 year old APHC registered gelding. Sorrel with blanket and spots all over his body, star, stripe, lh stocking and rh pastern. Quite a looker he is! He was bred and raised in Iowa by the Elmquists and the previous owner before me was Pricilla Juelsgaard also residing in Iowa. 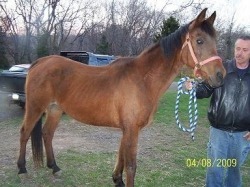 He was shown halter from the time he was a weanling until he was 2 years old. He has his ROM in halter. He grew just a bit too big for Ms Juelsgaard's liking and she decided to send him to Joey Jorgensen, who is a multiple World Champion, in multiple breeds as well as multiple disciplines. He had 90 days in Minnesota. Joey then sold "Rocky" at "Twin Cities Horse Sales", where Barry Hartranft bought him, and i purchased him from Barry in Ephrata, Pa.
Rocky has been nothing but a joy to have around, and his gentle dismeanor really shows that he has been in great hands since he was a baby! We are looking forward to showing Rocky this year in halter and western pleasure! See his bloodlines below. 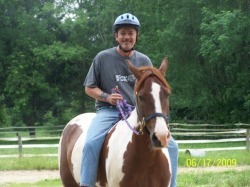 Meet Blue (WMR TEE JAY BLUE)- he is a 16 hand, 7 year old APHA registered gelding. Sorrel Tobiano (mostly white- not 50/50). A friend owned him since he was 2, sold him quite a few times to people that shouldn't even own horses. She loaned him out to a "Mexican Rodeo" where they forced him to rear and bow to the crowd. When mentioned that the Rodeo was interested in buying Blue, i stepped in and wrote out a check for him, not wanting him to endure that lifestyle. He has been through a long process of re-training. He now needs a soft, gentle rider. Any yanking or hard-core bullying he gets upset (who wouldn't?). He is at his safe-haven. He is loved very much by Robert and everyone else that meets him! See his pedigree below. Meet Diva (BARRS FLASHY LADY)- she is a 14.3 hand, 14 year old registered AQHA mare. I originally bought her for one of my lessors as a potential english/jumping mount. She came from Findlay College in Ohio. We soon found out that Diva disliked the english discipline and found out that western is more her style! She has a beautiful jog and 10+ lope, but her heart is really for doing gaming (barrels, poles, keyhole, etc). She is a very sweet mare to humans, but alpha mare in the herd- everyone stays out of her way! See her pedigree below. Fin is Ali's horse. She is a sweet mare and when i think of more to write i will (its getting late)!!!! Popcorn is a 16 year old, 15 hand Arabian mare. We rescued her last April emaciated and just about dead. We had our vet out to rule out any underlying problems for the weight loss. She hadn't had her teeth floated in 9+ years. 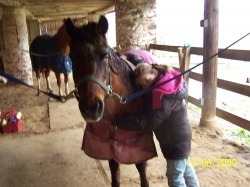 She has since gained weight and is quite healthy and loves giving children pony rides and is an awesome gaming horse. See more pictures of her recently since she has gained weight throughout our webpage. She's such a sweet mare! 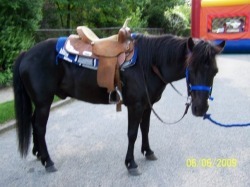 Black Jack is an 11 year old, 13.2 hand Welsh Pony. He is such a great pony for kids! When he works he almost falls asleep while working, he acts like he's 30!!!! Nothing phases this boy! He's had beach balls bounced off his back, balloons popped by his head, fire trucks roaring past him with their sirens roaring and it doesn't phase him one bit! He's a diamond in the rough! Lucky is a 12 hand, 30+ year old Shetland gelding. He is one pushy pony, but his sweet nature evens everything out. He is our star pony for the younger children, because of his small stature. He has won many ribbons at shows, he loves doing gaming. He also loves getting dressed up for costume classes! He is my 7 year old son's pony. My son has Autism and Lucky helps him through alot of things and makes my son's days much smoother!